The problem to solve hadn’t changed: how do we bring new expressions of event specific poetry to as many of the 10,000 festivalgoers as possible, in as many different places as possible? Magnetic Poetry seemed like a great place to start. After our ‘trial run’ at Mass MoCA Free Day, we thought the program was ready to scale up. Our goal was to blanket the entirety of the 13 acre campus with as much custom verse as possible. We printed up almost 200 square feet of poetry - 2500 gorgeously designed words that we installed in 30 unique locations (there is a TON of metal at the museum). ​We crafted and posted a lot of new poems for the event - riffing off the art on display, band histories, favorite lyrics, you name it. We also put up ‘word piles’ focusing on a specific band or theme, for the crowds to mangle at will. Quotes pulled from festival band lyrics and comedians could be found at dozens of locations. 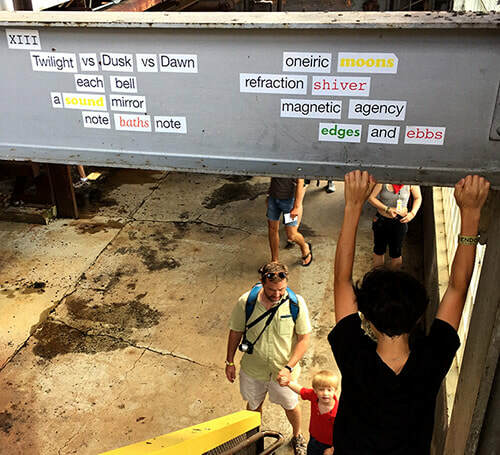 People had a field day – by the end of the weekend magnets could be found in every nook and cranny of the extensive space, the words morphing and traveling without rest. Then there were the typewriter poets. The idea is simple – step up to the table, sit with a poet, talk a bit, share your deepest secrets, and the poet types up a one of a kind collaboration. To give things some focus we added a carney twist – spin the word wheel and let the fates choose a starting point. After a full weekend of non-stop typing, countless new poems were born and sent home. 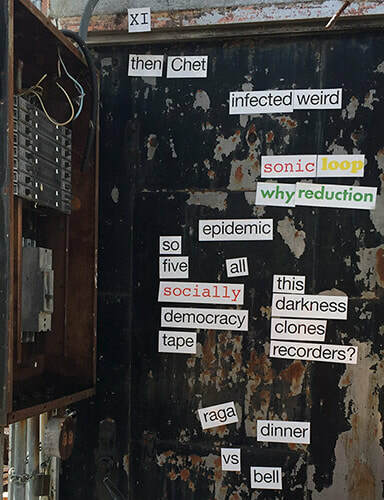 Here’s one of our favorite poems from the weekend – posted in 13 segments scattered through the assent of the Boiler House, one the coolest MASS MoCA factory remnants. or the intent of the air?